A nil bid can be the key to winning at Spades. But for a nil bid to succeed, the nil-bidder's teammate has to defend the nil well. In this example, we're going to see how a potentially good nil bid can lead to a loss when the defense strategy is poor. East was the dealer. North bid four first. West bid nil without knowing East's bid. This can be risky! Suppose East winds up bidding one. That's a sign of a weak hand - usually a bad hand for defending a nil bid. In fact, though, East bids four. And West has justification for making a nil bid. 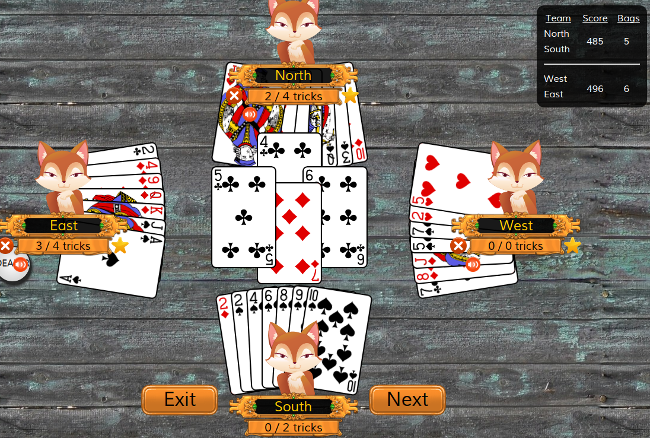 West's hand is pretty poor, with mostly low cards that are unlikely to take a trick. In addition, the scores are nearly tied, and the game is close to ending. A successful nil bid might win the game for the East-West team. North starts the play by leading with an ace. This is inexplicable! It helps the other team by allowing West to discard their highest heart. North leads the next trick with a low diamond - this is more like it! It is a clear attempt to force West to take a trick and set the nil bid. East takes the trick with the highest possible diamond, the ace. This is East's first mistake. It would have been wiser to take the trick with the 9 of diamonds, the lowest possible diamond that would take this trick. Generally, if you have the high cards in a suit, save them for leading when you are defending a nil. When taking a trick, use the lowest possible card to take it. West then leads with the king of hearts. This is fine; the ace is known to be out of play, so West will take this trick, unless an opponent trumps it with a spade. Either way, it allows East to discard their second highest heart card. West then leads with the ace of clubs. This is not completely wrong, but it's not what I would do. At this point, whenever I had the lead, I'd be leading diamonds. I had five diamond cards in my hand to start; I am long in diamonds. If I keep playing diamonds, it can lead to two possibly good things for my teammate: 1) I might exhaust all the diamonds in my teammate's hand, so that they can start discarding their high cards in other suits onto my diamond tricks. And 2) if North trumps my diamond tricks - a good possibility - West may actually be able to discard a spade under North's spade, provided they are out of diamonds. The goal of the nil defender in a case like this is to keep the lead if possible, repeatedly leading cards from their long suit, until their teammate runs out of that suit, and starts discarding cards from other suits. Unfortunately, East now makes the mistake of leading with the jack of clubs. There are two problems with this. 1) Leading with the jack means that West has no more high clubs with which to defend the nil bid. 2) Since the king of clubs is not out of play, this move invites the opponents to take the lead. In this case, this is a bad thing! When the opponents are leading, you are not in control of how your teammate is being attacked. You want to stay in control of the trick suit, bleed your teammate dry of cards in your long suit, and give your teammate as many opportunities to discard their high cards in other suits as possible. 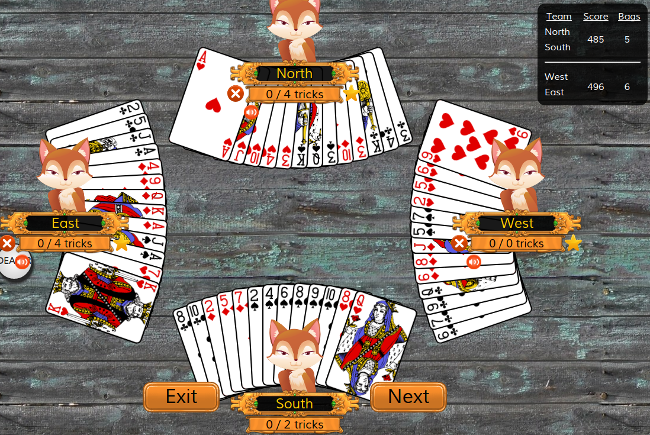 North takes the jack of clubs with the king, and then flushes out West's weakness in clubs. South is void in clubs, which allows them to stay out of the fray. East has nothing left to defend with, and West takes the trick. The nil bid is set. It might have been set anyway, if things had been done differently, but they'd have had a better chance with a different defense strategy. At this point, the East-West team has no chance of winning the game during this hand. To keep from losing the game, they'd either have to give the opponent five bags to roll them, or else they'd need to set their opponents. In fact, at this point, it is mathematically impossible to roll the opponents (if North-South take all remaining 7 tricks, they still do not have enough bags to roll). And East-West do not have the cards to set their opponents. They've lost the game! Play Spades at World of Card Games! You can play Spades against people from all over the world. Playing against the computer ("bots") is a great way to become familiar with the rules. You can also learn by running through the Spades tutorial. Visit the Spades Homepage at World of Card Games! Play Spades at World of Card Games now!